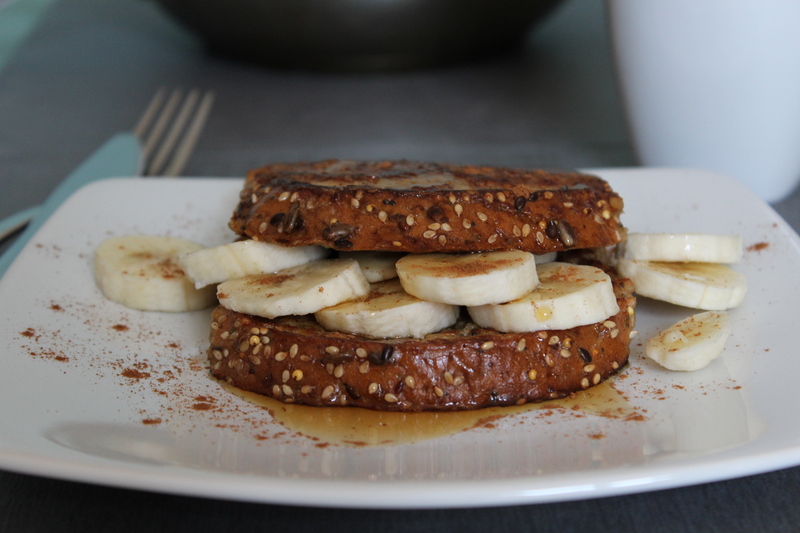 Golden, soft yet crispy cinnamon french toast, topped with banana and served with a drizzle of maple syrup. This is a breakfast favourite I can promise you will keep coming back to. French toast (or, honestly, eggy bread as it is called in my house) is one of my favourite breakfasts. I’ll tell you a naughty secret… I don’t just eat it on the weekends! 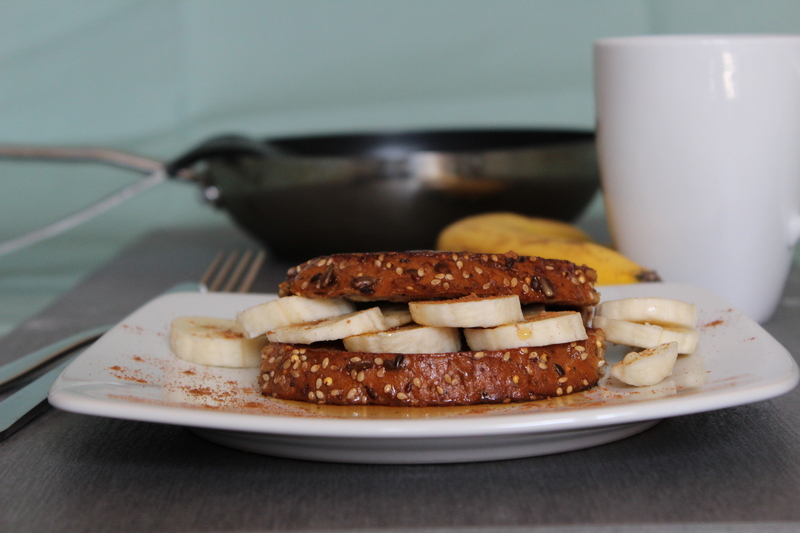 If I feel like I need a pick-me-up breakfast on a weekday, this is my go to recipe as it can always put a smile on my face. 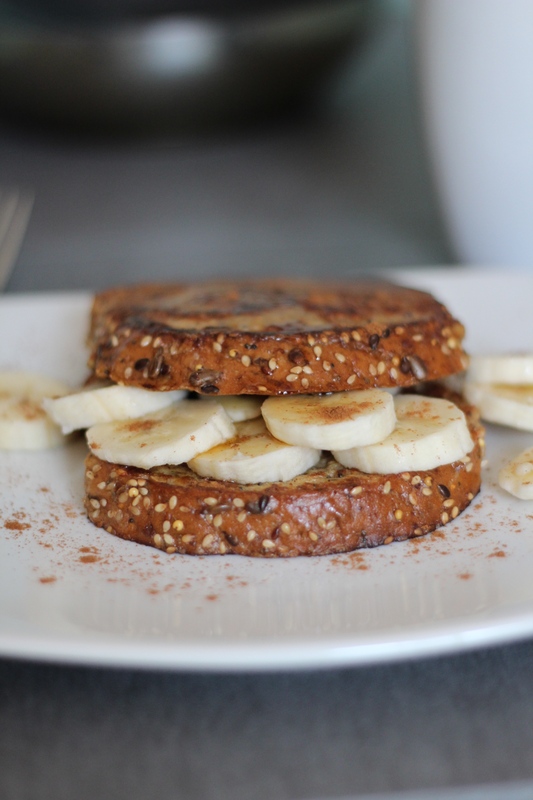 I eat french toast in several ways (try vanilla and blueberry with a sprinkle of icing sugar, or chocolate spread and strawberries) but this has to be my favourite. Despite drenching it in maple syrup, it tends to be a little less sweet than the other types, so you can try to convince yourself it’s better for you. Maple syrup is on the pricey side, but trust me when I say do not substitute it for honey or sugar. I used Waitrose Maple Syrup No.2 which has a stronger flavour – I prefer this to the lighter, less strong kinds as I find I tend to use a lot less which, for a breakfast recipe, is probably a good thing. Do make sure you buy pure maple syrup – not maple flavoured syrup, which is not real maple syrup, overly sweet and not maple-y at all. This is a very simple recipe, requiring only a few ingredients. It shouldn’t take more than 5 minutes from when you start to getting it in your mouth, which for any breakfast recipe is a winning factor. I hope you enjoy! Serves 1. Takes 5 minutes. In a dish beat together the egg, milk and cinnamon. Heat a non stick frying pan over a medium – high heat with 1 heaped tsp of butter. As the butter is melting, dunk both sides of two pieces of bread into the egg milk mixture, and then place in the pan with the melted butter. Fry the bread on both sides until browned and lightly crisped. I tend to add the second tsp of butter to the pan as I turn the bread over. Whilst frying, slice up a banana. 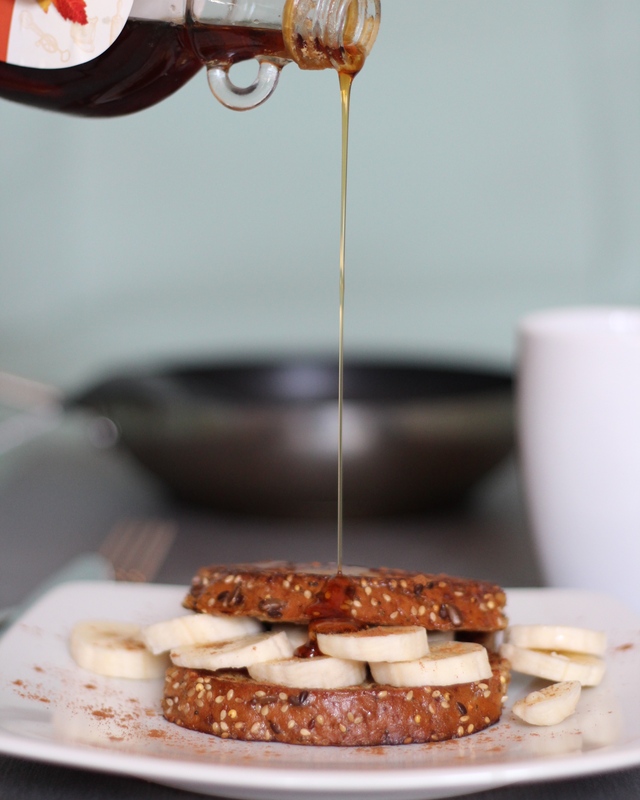 Serve immediately with the banana and a drizzle of maple syrup. Wow, what a simple great idea I am going to have to try this, thanks for sharing. No problem, thank you, and I hope you enjoy! !